This is the card that I decided to make for our son. I was inspired by another friend on the messageboard. I may not know all the people on the messageboard, but I feel that we're like close friends because we share our cards and talents on the board. We freely give our files for others to use. 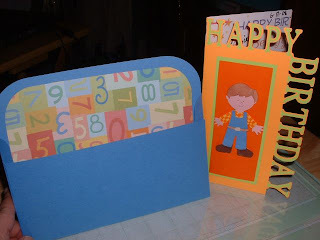 Here is the link to the card inspired by Diane; she used BC, Jasmine & Celebrations Cartridges. I didn't have the Jasmine cartridge or the Basecamp cartridge so I changed it using the Plantin Schoolbook and Celebrations. I added my Bob the Builder from my invitation to go along with the theme of the party. Diane I hope you don't mind my changing the file, but I wanted to make the card. Birthday Card. Thank you for bug inspiration...lol.